ProCoat's Powder Coating process provides a tough protective surface that can be custom tailored to meet the exacting demand of almost any metal coating application. Powder Coating far surpasses the capabilities of ordinary paint while still allowing the same colorful, creative freedom. The ranges of finishes and colors is limited only by your imagination! From flat to high gloss, metal flake to pearlescent, hammertoned to veined, custom color matching to crystal clears - Powder Coating does it all! ProCoat's technology pushes the envelope in the protection you can expect from metal finishing. Powder Coating provides excellent corrosion resistance to salt sprays and moisture. Specially formulated UV protective powders inhibit color fading while retaining their durability. ProCoat Performance Coatings "stocks in house" thousands of POWDERS in different colors and textures, including Commercial grade Anti-graffiti, FDA approved powders for the Restaurant Industry, Marine Grade Powders, just to name a few. 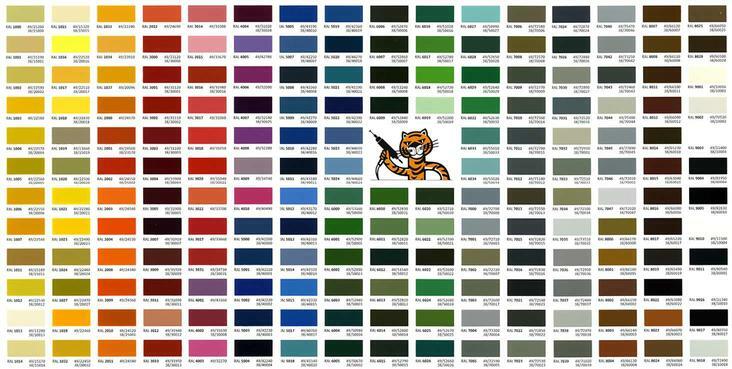 Custom color matching available! Please talk to our specialized representative at ProCoat Performance Coatings for the type of coating that is best suited for your project. ~ Please call Alan for advice on which color chart best servers your powder coating needs..If ProCoat Performance Coatings does not stock the powder requested for your job, powder is available in small quantities from Tiger Drylac in 5 lb. increments at an additional cost. ~ Tag on "color charts" Powder can be purchased in small quantities of 5 lb. increments at an additional cost, if ProCoat Performance Coatings does not stock the powder requested for your job. AAMA approved Architectural powder coatings available. Powder can be purchased in small quantities of 5 lb. increments if ProCoat Performance Coatings does not stock the powder requested for your job. ProCoat Performance Coatings is the pioneer in custom powder coating for the TAMPA BAY AREA established in 1994. At ProCoat we specialize in high-end, quality finishes. We meet and exceed the challenges that our Customers demand, providing the highest quality in Powder and Thermal Coatings. We guarantee quality, service and on time delivery. We are here to serve our Customers needs. Our highly trained staff is knowledgeable and highly diversified in every aspect of the coatings industry.